I want to write a shell script which copies the contents of the clipboard (plain-text only) when the previous content changes. When I launch the script each time I copy something (so the content of the clipboard changes) the script copies the new values into a file. I don't like this solution very much. There must be different ways to solve this problem. 2) Detect key pressed CMD+C. When the user presses CMD+C (shortcut for copy something into the clipboard) almost certainly the content of clipboard changes, but I don't know if is possible to detect the keystroke without installing additional libraries. 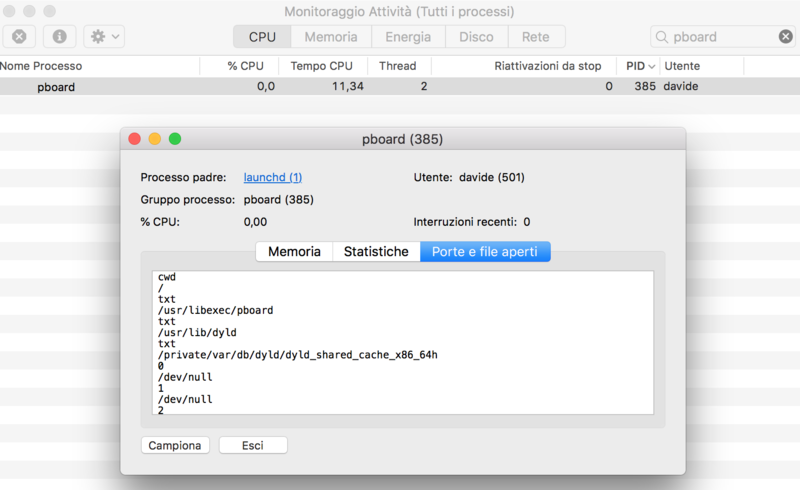 Can monitor the cpu or mem usage of the pboard process (when copying something into the clipboard the value of this percentage change)? Or (I don't know if is it possible) I can see to address space of the process? In your opinion, is there a better alternative to the script which I wrote, considering the alternatives 2 and 3? A product like this already exists and is available free on the App Store - Flycut. Not the answer you're looking for? Browse other questions tagged terminal keyboard command-line copy-paste . How can I tell exactly what keys are being pressed on the Mac? Applescript that efficiently listens for changes to the clipboard? Fast note app for quick lookup & copy to clipboard for osx & ios?